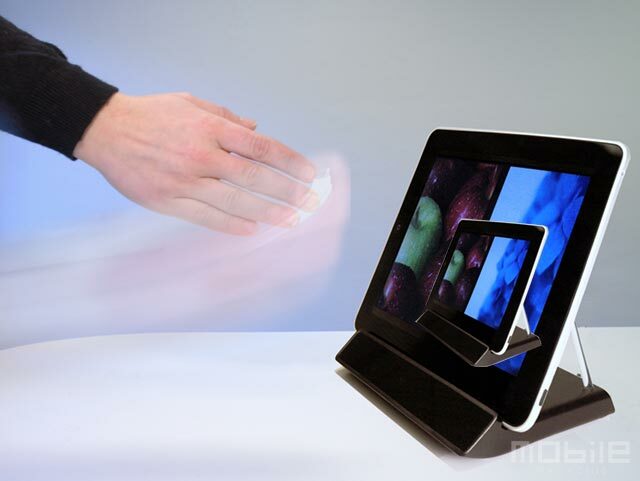 According to Mobile Magazine a Kinect-like gesture system for the iPad will be demoed in early January at CES 2011. Elliptic Labs is the company behind the technology and they specialize in “creating new and intuitive ways of interacting with computers.” For some time now the company has been working on a version of a Kinect-like gesture system for the iPad using a prototype tablet (video above). The technology behind the system sits in a special iPad dock and is ultrasound. This dock creates a “touchless zone” ” that covers approximately one foot in front and to the side of the iPad’s screen. Elliptic Labs’ CEO Stian Aldrin explained the vision for the technology on the iPad and its real world applications. Kinect-like gesture technology would be a huge feature for the iPad whether it comes via a third party or even from Apple. The video above shows it in action on a prototype device but check out a picture after the break with the iPad as the device being demoed.